Here is a sneak peak at some new modern baby announcement designs we have been working on… stay tuned there will be more to follow. These designs may be ordered as a one sided design and printed as a photograph, or both sides may be customized and printed on high quality press printed card stock. We also have a design only option if you prefer to receive the JPG and print the cards yourself. 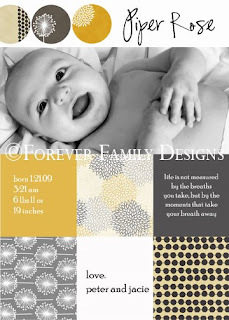 You can check out these and all of our other designs in the card gallery on our website at www.foreverfamilydesigns.com. We are always open to custom design requests and we are able to customize any of our designs to create the perfect announcement for your new bundle of love. Enjoy!